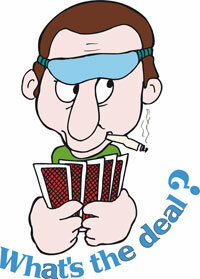 In order to become a consistently good bridge player it is very useful if one is a pragmatist. By this I mean the game cannot be learned and played by rote, one must constantly be prepared to alter strategies as conditions change at the table. The diagrammed hand occurred in a matchpoint duplicate game where overtricks are invaluable and where declarer was forced to find an alternative line of play when the opening lead was not to his liking. With East and West silent throughout, South dealt and opened 1 spade and North responded 2 diamonds which in their “2 over 1” system was forcing to game. South’s rebid of 2 hearts brought a 2 no trump bid from North which showed a balanced hand with clubs (the unbid suit) guarded. South felt his distributional holding favored a suit contract so he jumped to 4 spades to close the auction. West led a low trump and South paused to consider his options. The first thing he noticed was that, without a spade lead he could have played three rounds of hearts in an attempt to ruff a loser in the dummy. The opponents’ hearts were statistically more likely to be divided 4-2 rather than 3-3 so he could well have 2 losers in that suit if he couldn’t ruff at least one. The opening lead scotched that idea and it was time to change plans. South called for the spade 10 which was covered by the jack and king. He then played his solitary club towards the dummy and called for the queen. This was a relatively risk free move as even if the finesse lost he could later pitch one of his losing hearts on the club ace. However, the queen won the trick and now declarer looked around for more opportunities. He next cashed the ace and king of diamonds and crossed to the spade ace receiving the gratifying news that jack of trumps was falling. Now declarer called for the diamond 10 and got more good news when the queen fell, establishing the jack for another heart pitch from his hand. Now all that remained was for declarer to return safely to his hand with the heart king, draw the opponents’ last trump with his spade 9, return to dummy with the heart ace and discard his losing clubs on the ace of clubs and jack of diamonds. All in all this partnership scored 710 points for taking all the tricks and a near top in duplicate comparisons. You will have noticed that scoring 13 tricks is the equivalent of making a grand slam but of course it was not biddable. In fact, bidding even a small slam would have been extremely risky and quite anti-percentage. North and South only held a total of 28 high card points, well below the recommended 33 usually accepted as the minimum requirement for contracting a 12-trick slam. But the beauty of the duplicate game is that the combination of a skillful declarer and a little luck in the distribution meant that this partnership received almost the same match point score as though they had bid and made the grand slam!